Round #8 completed -- I'm Done with Chemo! Yesterday marked my 8th and last round of chemotherapy--an ordeal I dealt with over 16 weeks, beginning June 10. I still have the side effects of the Taxol chemo drug to deal with, and there's still a bi-lateral (double) mastectomy surgery for me to cope with/recover from in a month, but for now I am celebrating the end of my chemo--what I hope to be my first and last chemotherapy treatment ever. And so I'll just leave you with two things--a plug for my friends Greg Massa and Raquel Krach of Massa Orgnics. I first met Greg and Raquel at UCSB. In fact, I first met Greg when we were both freshmen living in the same dorm. I had the pleasure of visiting his family's rice farm one summer and was taken to a yummy Basque restaurant in the Chico area. When Greg found out I had breast cancer, he put a carepackage in the mail to me filled with yummy, nourishing, and healing/organic food: brown rice, brown flour, almond butter, and my all-time favorite, ROASTED ALMONDS. The day I received his package was during my first round of chemo when I had just lost my taste buds and everything tasted like cardboard. For someone, like me, who not just loves to eat but who lives to eat, this was one sad state of affairs. So when I opened up Greg's gift, I didn't have much hope that I'd be able to taste anything. But LO AND BEHOLD! When I popped an almond in my mouth I experienced the sweet and nutty and roasted taste of one this almond which makes it HAND'S DOWN THE BEST ALMOND I'VE EVER TASTED IN MY LIFE. And during the next few weeks, whenever I felt nauseous, I would pop almonds in my mouth--Massa almonds I mean--and they had both a calming effect on my stomach and also tasted good. A magic combination for anyone going through chemotherapy. I ordered 2 more pounds to make it through to the end of my chemo and am on my last handful as we speak. 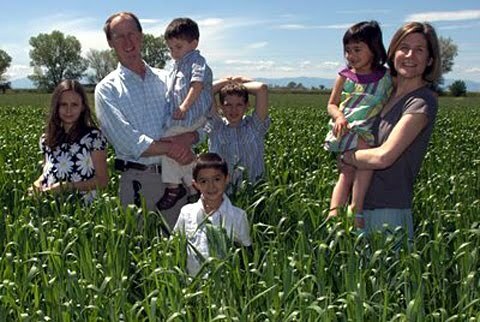 This photo of the entire Massa-Krach family is taken from their farm's website, and as you can see, they are a beautiful family. What may or may not be evident is that all five children are adopted (and I'll be writing more on adoption and my own thoughts/feelings/experiences with this in posts to come). For me, Greg and Raquel's family is an inspiration--so between their responsible farming techniques, the yummy organic products that they sell, and the emphasis on sustainable living that they embody in all aspects of their lives, I just want to say that while I normally don't plug businesses on this blog, in this case I think you should at least take a look at their website--and if you end up ordering their rice or flour or especially some yummy almonds, you won't regret it! Finally, let me leave you with a PSA from the National Breast Cancer Coalition, an advocacy group that is highly rated on Charity Navigator, who works not just to educate people about breast cancer but to ensure that research funds are being spent on actual scientific research AND they help lobby congress, especially to address the environmental toxins that contribute to about 80-90% of the cancer diagnoses in the U.S.--most people think it's genetic, but for women with breast cancer, only 10% carry the BRCA1 or BRCA2 gene--and even if you think another 10% is genetic based, that still means that 80% of us developed cancer because we live in a very technological, industrialized nation where the air we breathe and the water we drink and the plastics our food sits in could be contributing to cancerous cells growing in our bodies. I know that sounds scary, but I if you are interested, please read this article about breast cancer's link to the environment. Tomorrow will mark the 9th anniversary of the attacks on the World Trade Center, the Pentagon, and the attempted attack on the White House. By now just about everyone knows the name Pastor Terry Jones and his plan to burn hundreds of copies of the Koran tomorrow (if you don't know what I'm talking about, click here for a New York Times article), as well as the waffling and last minute bartering he has been doing, linking the burning as a chip to be used to move Cordoba House--the interfaith and Islamic center that is a few blocks from the former site of the twin towers. But rather than focus on Jones and the other voices of bigotry and Islamaphobia and hatred, I thought that a more appropriate way to observe the magnitude of our worldwide losses of tomorrow's anniversary is to actually focus on a story of charity and friendship between Christians and Muslims represented by the Heartsong Church and the neighboring Islamic Center in Memphis, TN. Essentially a year ago the pastor of the Heartsong Church, Steve Stone, learned that an Islamic Center would be built right next to the Heartsong Church, so he put up a sign that reads: "Heartsong Church welcomes Memphis Islamic Center to the neighborhood." And because the center wasn't ready in time for Ramadan observances, the leader of the center, Dr. Bashar Shala asked Pastor Stone if they could use Heartsong Church for Muslim prayer services during the month-long Ramadan observance. A true interfaith friendship--and a model for what more groups (and people) should be striving for. Back on May 1, when I first announced that I had been diagnosed with breast cancer, I had thought that I would share stories about my observations about the intersections of my two new worlds: cancer and race. And I did share one story -- the horrible interaction I had with the lab tech and the comical interaction I had with the radiology fellow (where my poor left breast was flopping in and out of my gown due to my wild gesticulating of my hands, since whenever I get passionate and especially ANGRY I not only raise my voice, I throw up my arms--for the full comic account of this interaction, click here). And now that I have chemo brain, the few anecdotes I had stored away seem to have melted away with a lot of my short term memory and focus. I can recall being in the 2nd floor waiting room of my oncologist and overhearing a conversation between two workmen who were repairing the lights on the floor. One was a twenty-something Latino man and the other was a forty-something white Southerner. The men spoke to one another in English, and seemed to have an easy going or at least collegial working relationship. An African American nurse, who seemed to know the Latino man, said something to him in Spanish, which I didn't quite catch, but it made the young man smile. His colleague smiled and the young man asked him if he spoke Spanish and the forty-something man said, "Why'd I want to learn something like that for? You won't catch me speaking Hispanic--you should speak English!" Now, the forty-something man said all of this in a relatively good-natured way, despite the offensive nature of what he was saying. I mention this because tone and facial expression makes a big difference. The forty-something white Southerner seemed to think that he was joshing and joking around with the twenty-something Latino man. And clearly, this young man DID speak English--he also happened to speak Spanish, which seems like a BONUS in this day and age. So the forty-something's vehement declaration that "you won't catch me speaking Hispanic" speaks to his limited and worldview (as well as the inaccuracy of naming "Hispanic" as a language). As this exchange played out, I stared at the forty-something white Southerner, who noticed me noticing him, and perhaps realizing that making these kinds of jokes on the 2nd floor of the oncology ward of the cancer hospital in front of patients of various ethnic and racial backgrounds was probably not the smartest or most sensitive thing to do, because he quickly turned back to his work and told the young man to finish up with this project and then he left, ostensibly to another work project elsewhere. I suppose what would or could have made this more uncomfortable would be the presence of a Spanish-speaking family also in the waiting room. And I have seen Latino families, and female and male patients, both on the oncology floor as well as in the chemo waiting room. There is also a Latino receptionist who is one of a dozen people who checks in patients on the ground floor before dispersing us to the various floors--radiology, mammography, chemotherapy, oncology, hematology. But one of the most remarkable things I've found is that in the 9 chemo treatments I've had over 14 weeks, in the 4 months I have been in and out of various doctor's offices, mammography clinics, and cancer floors, I have yet to see another Asian American patient. I've had fellows come into my room who are shadowing/working with my oncologist who are South Asian American. And there is a lovely volunteer, a recent grad from Southern U. who is Asian American and who will be applying to med school this year (he lives close to the hospital). And I have seen Asian faces wearing hospital scrubs or gowns--folks who are clearly associated with the cancer hospital in some way. But I haven't seen any Asian Americans sitting in a chemo chair, waiting in any of the waiting rooms, or even wearing street clothes, like I do. In other words, in the 4 months since my cancer diagnosis, I appear to be the only Asian American cancer patient at Southern U. Cancer hospital. Logically I know this cannot be the case. There has got to be at least ONE other Asian American patient receiving chemotherpay, right? But if there is, I haven't seen him/her. And there aren't any Asian Americans in the yoga class I go to that is dedicated for cancer patients. And I've never seen any in the Cancer resource center. I haven't even seen any Asian Americans accompanying cancer patients--in fact, there aren't many inter-racial pairings in the chemo ward. Mostly it's couples and families, which means that husbands accompany wives or vice versa, and it's pretty much been black couples and white couples and Latino couples. But I haven't seen any inter-racial couples, or even inter-racial friendships--when it has been two women, it has been two African American women or two white women. Which makes my own presence in the chemo ward an exercise in mixed race dynamics since I have had a variety of family and friends sit with me through my infusions: my Chinese Jamaican mother, my Chinese immigrant father, my white best friend from CA, my Vietnamese American close friend from Southern U, my Chicano close friend from Seattle, and of course Southern Man. We are a striking couple, I suppose, not just because Southern Man is 6 feet tall and solidly built (he's pretty strong--he can throw me over his shoulder like a sack of potatoes--and I'm not petite) but because I don't think most people encounter another inter-racial pairing in the chemo ward, or even in the oncology floor. Which also may explain why everyone seemed to remember my name immediately. I mean, the cancer center sees so many people daily--there are over 100 chemo bays and my best guess is that they see at least 100 people (or more) everyday. And yet after my first visit, all of the receptionists and nurses and even the person at the parking lot seemed to remember my name. And I always thought it was odd--I mean, I know it's the South and people are friendly, but this is a large Cancer hospital--a major medical center. And the only thing I can think of that makes me different and stand out is that I may, in fact, be the only Asian American cancer patient that they have, AND I'm probably the only one who has such a mixed race entourage of friends and family accompany me to my appointments. All of which makes me wonder, is having a mixed group of friends or being in an inter-racial relationship really so unique in the 21st century in a Southern college town? Because shouldn't I be the norm rather than the outlier? Or is it just my fate to continue to be the minority--and really, why should my minority status be any different now that I have cancer?